EAST AURORA, N.Y.--(BUSINESS WIRE)-- Astronics Corporation (NASDAQ: ATRO), a leading provider of advanced technologies for the global aerospace, defense and semiconductor industries, announced today that its wholly owned subsidiary, Astronics Advanced Electronic Systems (AES), is expanding its existing EmPower® System product line with a new USB Type-C In-Seat Power System. The new system supports the emerging standard of USB Type-C charging for the newest generation of passenger electronic devices (PEDs). The new EmPower system is comprised of an in-seat power system and passenger outlets. 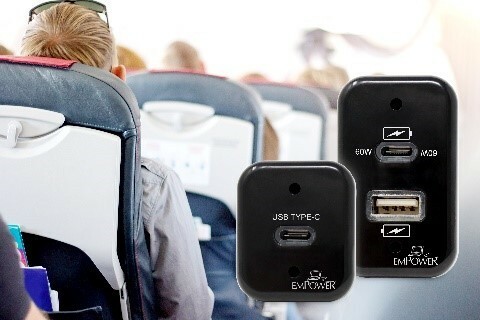 The in-seat power system supplies up to four aircraft seats with up to 60W of power through USB Type-C outlets. The new outlets are available in a standalone Type-C configuration or in a dual USB Type-C and USB Type-A configuration, which supports both legacy and current PEDs, such as smartphones, tablets and laptops. A state-of-the-art topology delivers the most efficient, lightest weight and smallest form factor Type-C in-seat power system available on the market.